Dementia is one of the fastest growing conditions in Australia. In Australia, an estimated 400,833 people have dementia, including 25,938 people living with younger onset dementia. Nationally, the dementia prevalence rate is growing at a rate of 3.8% for males and 2.5% for females, meaning around 244 people in Australia are diagnosed with dementia every day. Statewide, Tasmania’s dementia population is expected to grow to more than 20,600 by 2056, with the fastest growth predicted over the next two decades. Dementia can be estimated by applying dementia prevalence rates to population data. 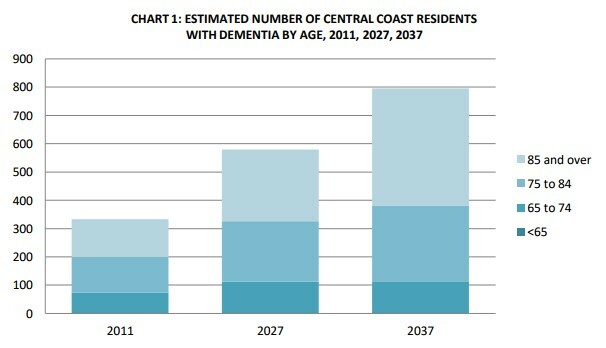 In 2011, there were an estimated 332 residents of Central Coast with dementia. based on population forecasts for 2027, the population with dementia is projected to be 579. By the year 2037, this number is projected to be 795.